StableNet® as a unified 4-in-1 solution has to be considered as the global market leading NCCM software amongst other network management tools. 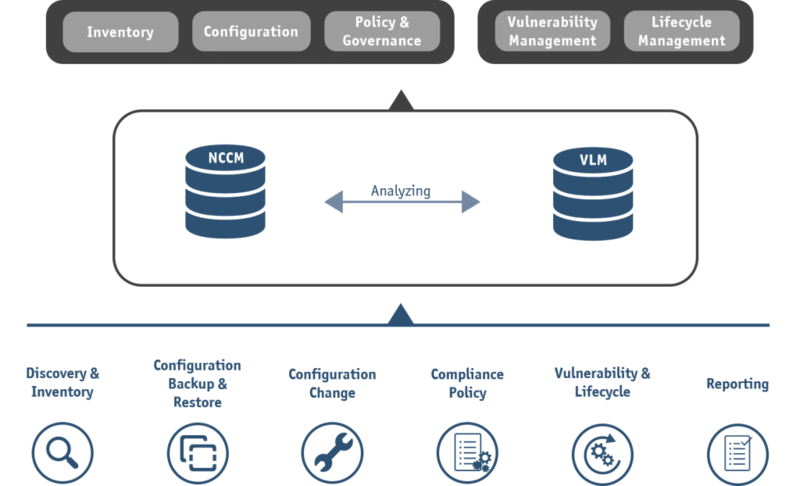 The NCCM tool is fully integrated within StableNet® to deliver a true single-product management solution of any companies’ ITIL service and change management implementation. Configuration standards can be built based on corporate policies, therefore violation of these standards can be mitigated. The StableNet® NCCM software not only captures every configuration change (Who? What? Where? When?) for a device within its database, but also has the ability to structure large-scale changes into jobs for controlled executions and also roll-back. Configuration changes can be made either by using simple CLI commands or by using more powerful logic-based snippets and templates which enable less technical staff to make routine changes. Zero-touch provisioning and auto-rollout of services saving you time and money! Ready to start your hands-on StableNet® experience? Is your current NCCM software still sufficient for your needs? Do you put large amounts of staff time and money in rectifying change-related faults due to human error? Do you spend an immense amount of time to track (ad-hoc) configuration changes for devices? Has restoring become a time-consuming task due to ineffective management of backups? Do you spend too much time and money on checking device vulnerabilities and EoL/EoS updates? If you answer at least once with Yes, it’s time to get in touch with us!